Abigail was born a beautiful and cheerful baby girl in the spring of 2011. But from the day she was born, her mother knew something was wrong. After seven long months of worry and uncertainty, Abigail was diagnosed with semi-hemispheric polymicrogyria (a condition in which the left side of the brain is severely under-developed). Can you imagine the heartbreak her parents felt? While her doctors said she would not speak, walk or even laugh, Abigail had BIG plans. Not only does she talk, she laughs just as any little girl should. Joy radiates from her every moment of the day. 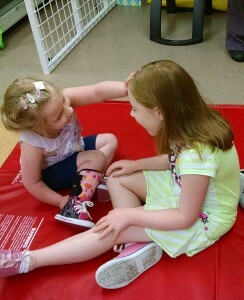 Abigail has struggled with walking and the use of her right hand, but has utilized the Children’s of Alabama’s spider program and constraint therapy program since March 2012. She has made steady progress as you can see from this Instagram video taken at the Ronald McDonald House in Birmingham. Abigail and her mother have now used the RMHCA facility during some fifteen trips for this therapy and other treatments — staying for as long as 9 weeks. At first, this was hard on the entire family, especially her older sister Maddy Kate for whom the separation was too much to handle at a young age. “She would worry herself sick. She developed shingles every time we started packing to leave,” says their mom, Barbara. 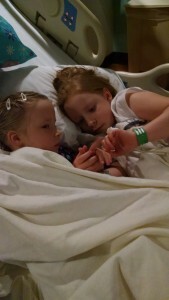 During September, Abigail faced her next big hurdle, brain surgery. The expectation was that she would not be able to walk for six months, but after just three weeks, Abigail took her first steps at RMHCA (as you can see on Instagram). Keeping families together is what we do at the Ronald McDonald House — this story of sisters needing each other explains why our mission is so important to so many. 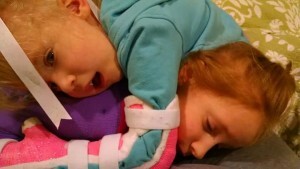 We are very happy we have been able to keep Maddy Kate and Abigail close to one another during their time of need. You can adopt-a-family like Abigail’s by donating online. It costs RMHCA $95/night to house a family — any amount you can give is appreciated. Follow Abigail’s story on Facebook through her page — Abigail’s Army.